Already had the ActiveYards at home experience? If you've decided to have a professional install your fence, then choosing the right installer is one of the most important aspects of your fencing purchase. That's why we've created the ActiveYards certified dealer program to ensure your fencing installation is completed properly and professionally. 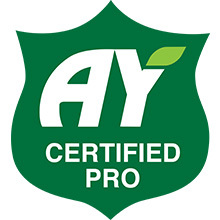 Because all of our certified dealers are thoroughly trained and authorized to sell our products, you'll never have to worry about a lack of professional support and service. We qualify every one of our dealers based on their reputation, longevity and experience in the industry so that you can be sure you're getting the best service possible. With the backing of one of the nation's largest manufacturer's of fencing, you'll have the peace of mind of knowing that we'll be there for you as long as you need us. With our transferable limited lifetime warranty and no-questions-asked replacement policy, you can rest assured knowing that we stand behind every product we sell. Because we are so confident in our dealers, innovative designs and technology, we guarantee that our fences will stay durable, functional and beautiful for years to come. Find an ActiveYards certified dealer near you. ActiveYards Certified Dealers are specially trained and certified to expertly install ActiveYards fencing. ActiveYards Certified Dealers receive ongoing product information, training and support from ActiveYards. ActiveYards Certified Dealers have access to an ActiveYards product and technical team with additional expertise. ActiveYards Certified Dealers stand behind their work, and ActiveYards stands behind them.